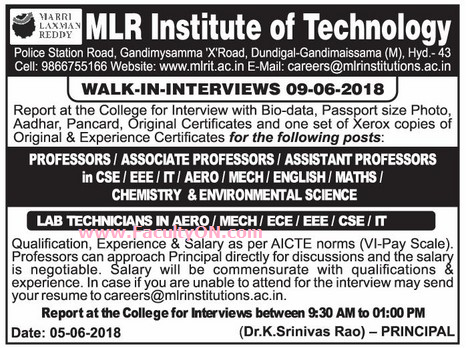 MLR Institute of Technology, Hyderabad has advertised in the EENADU newspaper for recruitment of Teaching Faculty- Professor / Associate Professor / Assistant Professor Plus Non-Faculty jobs vacancies. Interested and eligible job aspirants are requested to walk-in on 09th June 2018. Check out further more details below. About College: MLR Institute of Technology was established in the year 2005 with the aim of providing quality education to all sections of the society. The college is being run by KMR educational society under the able chairmanship of Sri M Laxman Reddy. The college is approved by the All India Council for Technical Education ( AICTE) and is affiliated to Jawaharlal Nehru Technology University, Hyderabad.